Just Romantic Suspense: Why Do You Do What You Do? Congratulations to "Jonetta A." and "Mary P.", the winners in Susanne's giveaway. Thank you to all who participated! 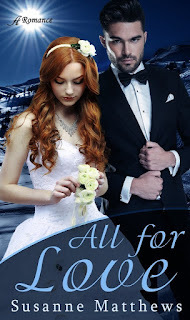 Hello again, it’s so nice to drop by and visit with old friends to talk about my latest romance suspense novel, All For Love. This is the sixth romance suspense novel I’ve published, and in some ways, it’s been one of the biggest challenges of them all. The focus of the story isn’t on the budding romance or the horrors inflicted on the hero and heroine by the villain. No, in this book, I strove to examine motivation—why people will do what they will for others—and there is no greater motivation than fear. People will tell you love is the great motivator, but to me, the fear of losing that love and those you love is far more powerful and is at the root of the novel. The title says it all. Everything that happens in the story happens All For Love. The novel revolves around a number of different types of love: the love and respect we have for friends and family, the love we have for sports that motivate and invigorate us, and the love we have when we’re lucky enough to find our soulmate. It’s also about obsessive love, the love for power and revenge, and sadly money. We know that love is an incredibly powerful emotion, and most of the time it brings out the best in people, but sometimes love can be destructive. Obsessive love is the villain’s reason for acting, and is his desire for revenge. Love can blind us to the inadequacies of others and make us see things far differently from the way they are. The killer feels he’s been robbed, cheated of what is rightfully his, and someone has to pay for the loss. Who better than the man who caused it all? No one is safe until he’s gotten payback. For Greg Simmons, the hero, there is the love a parent feels for a child, a child endangered by someone with a grudge against Greg. My hero will do anything it takes to protect his daughter, including hiring a bodyguard and marrying this stranger to give his teenaged daughter the opportunity of a lifetime. When he finds himself falling for his new wife, there’s another component to his fear. If the villain discovers the truth, Olivia will face the crazed man’s wrath, too. For Olivia Marshall, love means pain and loss. While skiing is her passion, after an avalanche and the deaths of her fiancé and her cousin, she gives it all up to work for Anderson Security, protecting and saving others from danger—an atonement for the lives of those she couldn’t protect. But, to do her job, this time she has to face her greatest fears—marry a stranger, and get back up on her skis—a young girl’s life depends on it. The fact that she’s attracted to her client, just confuses her, because if he ever learns the truth about what happened on the slopes that day, whatever he feels for her will surely turn to hatred. All For Love touches on self-love as well. People often blame themselves for things over which they have no real control, and that’s another great motivator for behavior and actions. I hope you enjoy the novel and understand, that in the end whatever we do we do All For Love. Olivia Cummings rolled over and tried to hit the snooze button on the alarm, remembering she’d moved it onto her dresser for that very reason. Like it or not, she had to get up. She opened her eyes and groaned. The room was still dark. Why wouldn’t it be? The sun wasn’t up at five in the morning in mid-December. She threw back the covers, shivered, and reached to turn on the bedside lamp. She blinked owl-like at the ensuing brightness. She plunged her feet into the mules beside the bed, grabbed her housecoat, and went into the kitchen to make coffee. The single brew machine was one of the few things in the apartment that belonged to her. She’d feel better after she gave her body its morning dose of caffeine. While she waited for the coffee maker to do its job, she went over what she’d packed last night. One of the problems with going home at this time of year was everything she had to take with her—heavy coat, boots, clothes, gifts—she’d look like an Inuit at the Philadelphia airport, but without the warmer coat, she’d freeze in Denver. The rasp of the coffee maker indicated her cup was full, and she reached for it gratefully. Her flight was at nine, and the airlines insisted she check in two hours early. Security, even on domestic flights was heightened at this time of year. She sighed. The last place she wanted to go was to a ski resort in the Colorado Rockies, but when that was home, what choice did she have? She looked down at her slim ankle, debating whether or not to bandage it. It hadn’t given her any problems in months, but it was her crutch, her protection. Like a guardian angel’s shield, it would keep her out of danger. Besides, what was one more lie? She’d told a thousand of them in the last five years. Anything to keep her old friends and family from badgering her out onto skis would be worth it. She reached for the lightweight, polymer and foam removable brace she’d pulled out and wiped down last night. “Shower first, and then, let’s get you on. At least you fit inside my UGGs,” she spoke to the brace as if it were an old trusted friend. She’d let everyone think her leg and ankle were still too weak to use. She hated dissembling like this, but she didn’t want anyone to know the real reason she’d chosen never to ski again. That was between her and God. Coffee mug in hand, she headed to the bathroom, to get ready. She hadn’t been home for Christmas since the accident, but Mom and Dad wouldn’t allow her that luxury this year. If she could avoid the slopes and the chalet, it might not be too bad; if she couldn’t, the pseudo injury would limit her skiing to the lodge. Forgive me, God, but I’m just not ready to let it go. I will be giving away two e-copies of this book, but there will be a little delay on delivery as I will be on holiday until the 24th. Someone is out to destroy Greg Simmons and everyone he has ever loved. After an accident leaves his teenage daughter depressed and distraught, Greg will do anything to make her happy again, including hiring a bodyguard to protect her. Olivia Marshall lost both her fiancé and her cousin in a deadly avalanche. She has vowed never to set foot on a ski hill again. But now, working as a bodyguard with Anderson Security, Olivia must face her greatest fears to save Greg and his daughter. Something about Olivia’s determination strikes a chord in Greg, but will she be the salvation he needs, or will he be her destruction? Giveaway ends 11:59pm EST June 16th. Please supply your email in the post. You may use spaces or full text for security. (ex. jsmith at gmail dot com) If you do not wish to supply your email, or have trouble posting, please email maureen@justromanticsuspense.com with a subject title of JRS GIVEAWAY to be entered in the current giveaway. I'm intrigued by your thought provoking premise for this story. Thanks for the giveaway. ALL FOR LOVE sounds like such a great read. You have my attention with Greg and Olivia's story... sounds really good. Thanks for sharing! This books sounds great! I would love to read All For Love and find out if/how Olivia saves Greg and his daughter. T%hanks Maureen for having me here. I've contacted the winners and hope to have more to share with you all in the future.